ђ. The rhizome stiff, strongly branched. Stem 8 - 50 cm high, 0.15 - 0.3 cm wide, round, in the upper part of the base highly branched, short thick white or gold-plated, branched fibrous. The leaves 0.8 - 3.5 cm long, 1 - 10 mm wide, opposite, seated, broadly elliptical, elliptical, lance, back ovate, narrowed to the base, with edges of varying degrees curved inwards, diluted greenish to short-dense white or golden fibrous, passing through the prickling, in the bosom with smaller leaflets. 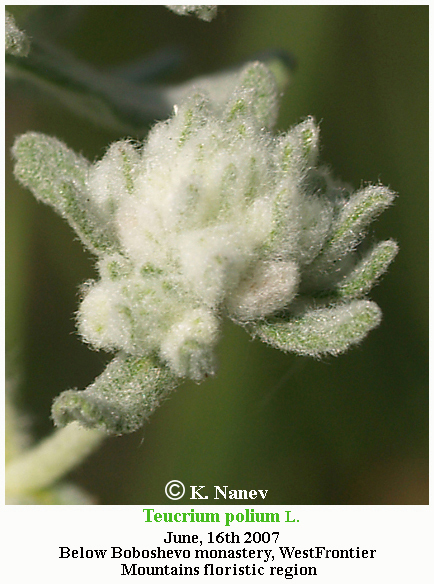 Blossoms white or white with a yellowish hue, collected in numerous heads at the top of the stem. The tube of the crown 3 - 4 mm long, tubular bell, with 5 unequal, on the top dull toothbrushes, short thick white or golden throat. The tube of the crown 3 - 4 mm long, lower lip triple: the middle share largest, elliptical, pointed to the top up to the rounded, the lateral smaller, triangular, the upper lip residue very small, triangular; the middle share goal, the lateral, or the middle and the side, are covered. The nuts 1.5 - 2.5 mm long, elliptical to pear-shaped, on the surface reticulated wrinkled, dark brown to black. Subsp. polium. Blossoms collected in single heads. Plants very long-lined fibrous. He does not meet with us. Subsp. capitatum (L.) Arcangeli, Comp. Fl. Italian. (1882) 559; Tutin et al., Fl. Eur., III (1972) 134; T. capitatum L., Sp. PI., Ed. 1 (1753); T. polium L. var. angustifolium Koch, Synopsis, ed. 3 (1857) 449; Стоян, Стеф., Фл. Бълг., изд. 1, II., изд. 1, II (1925) 926. Stem 8 - 25 cm high; leaves 0.8-1.5 cm long, lance, elliptical. Distributed. Subsp. vincentinum (Rouy) D. Wood, Bot. Journ. Linn. Soc. (1972) 261; Tutin et al., Fl. Eur., III (1972) 135; T. polium L. var. racemiflorum Bornm., Bot. Centralbl., XXXVI (1883) 126; Yel. Fl. Bulg. (1891) 443; Hayek, op. c., 248; T. polium L. var. vulgar Koch, 1st c. Stem 26 - 50 cm high; leaves up to 3.5 cm long, back ovate, broadly elliptical. Distributed. Note. Individuals from different populations differ in the degree and color of the fiber layering. This variation has given rise to the description of many varieties and forms (f., viride Hal., f., bombycinum Helder, var. 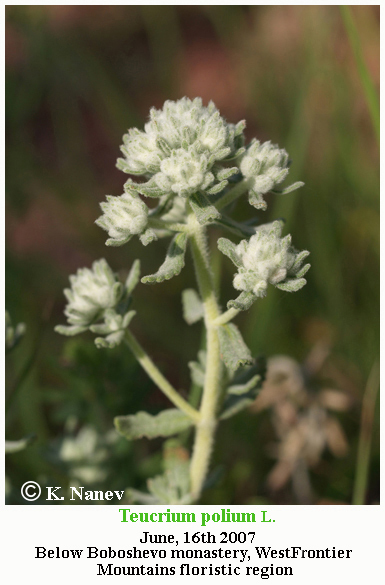 luteifolium M.V.) without taxonomic significance according to us. 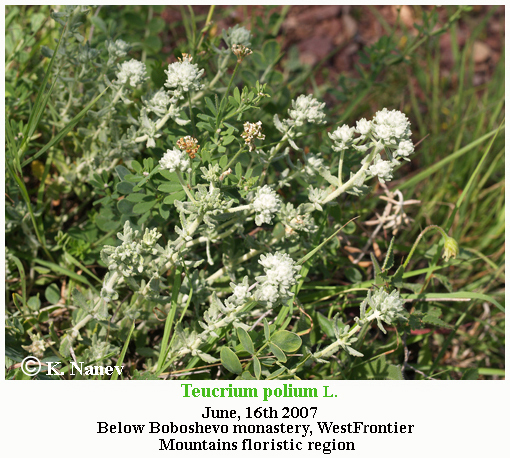 T. polium is used for various supposed treatments in traditional medicine, although it has potential for causing liver toxicity. Flowering Time: Blooms: IV - VIII, fruitful: VI - IX. Distribution in Bulgaria: Grow on dry limestone and silicate rocks, on sands and seashore rocks. Spreading from sea level up to 1,000 m altitude. (Conspectus of the Bulgarian Vascular Flora) = conspectus&gs_l= Zlc. Distribution: Central (Eastern) and Southeastern Europe, the Mediterranean, Southwest Asia.